Sushi, tea, and other goodies that make our bellies… happy! One morning while we were in Victoria we decided to go to Beacon Hill Park – a lovely seaside park basically in downtown Victoria. It’s a large park, and connects to other open areas for jogging, biking, walking, and dog-walking to enjoy lovely seaside sights on one side and glimpses into Victoria on the other. We left our hotel with the plan to pop into a cafe or something on the way – after passing one or two which we weren’t interested in, we found ourselves in the park… with no cafe in sight! We walked for a while, before running into some friendly and helpful locals who pointed us out to the Beacon Drive-In. It was very busy; mostly schoolchildren who seemed to be on a trip or tour, but there were still a few spots on the outside patio. They offer simple, ordinary diner food – ice cream, pop, burgers, milkshakes, fries, etc. 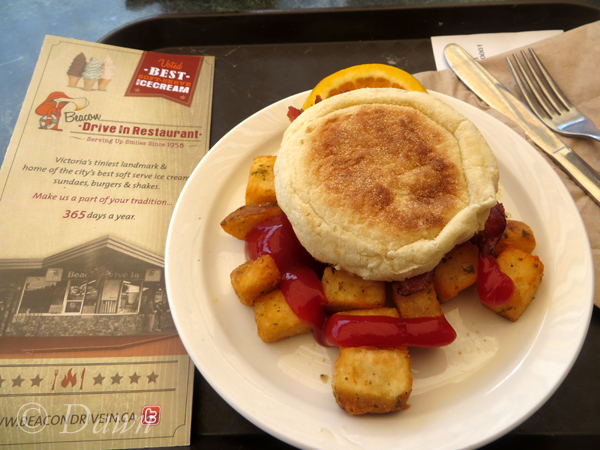 We each had a breakfast sandwich with hashbrowns – they were ok, but really nothing special. So.. if the food wasn’t so impressive…why bother posting? Ocean (and bird!) views from Beacon Hill Park. Near the pond in Beacon Hill Park. Hydrangea in Beacon Hill Park. Watering can interactive fountain in Beacon Hill Park. Beacon Hill park is just too pretty not to share! That’s another photo that looks like an advertisement for the restaurant! I would totally eat there if I lived in Victoria. Oh thank you! 🙂 That’s a great compliment! Follow Happy Sushi Belly and get updates through email!